So what have we been doing….. 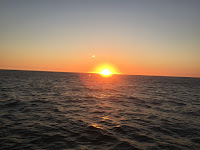 The next leg was 63 miles to Dongara or Port Denison. We were intending to hole up here until after the weekend as there was a big wind coming and we didn’t want to get caught on this coastline. We had looked on Google Earth, Google Maps and Navionics and thought there was room inside the breakwater for us. Again there was a marina there but we had not made any arrangements to stay there and as it was pretty small we didn’t really expect them to have room for us. Once we poked our nose in behind the breakwater we soon realised there was no room in the deep water for us, so back out behind the breakwater for us:) As with all anchorages on this coast it was rolly but not uncomfortable and very pretty:) We never get sick of these sunsets! Not wanting to get caught here we left early the next morning to go 38 miles to Geraldton. There is a good sized marina here so we emailed ahead to request a berth until after the strong winds passed. The hospitality and generosity we experienced in 2014 was in full force once again. We got an end berth and the crew off a charter boat next to our berth all jumped off their boat to tie us on:) The cook gave me one of his recipes:) The harbour master said stay as long as you like but the berth is booked on 28 April so if you could leave before then:) Such an amazing place! The supermarket is across the road so we checked it out but really only needed a bottle of milk so we decided to walk 3kms to Bunnings:) We got out of there with our shirts still on our backs and headed back to the boat. A night off cooking…. pizza delivery! 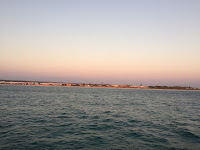 We stayed on the berth for 3 nights and departed for Port Gregory Mon 24 April. Once again, this was an unknown anchorage behind a reef where we hoped we could get safe shelter. I would like to come back here sometime as just over the sand dunes is the largest pink lake in Australia:) Very remote and very beautiful but strong winds overnight. 30+ knots at anchor so we put the anchor alert on and slept fitfully through the night. 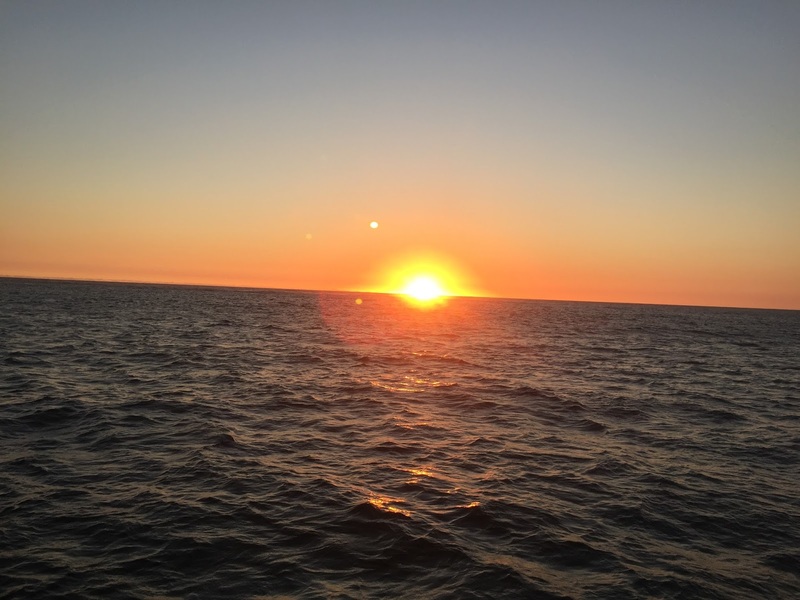 And then it was the overnight leg….. 144 miles to Shark Bay. As usual I dreaded this leg but we took it in our stride and I have to say Ron and I are getting pretty good at these legs. By going to Port Gregory first we took about 6 hours off the trip and couldn’t leave until 10am so I was happy! A bit of an easy morning:) Had we left any earlier we would have come through the gap at Shark Bay in the dark which we weren’t too keen to do. We started off with perfect wind conditions so we put the mainsail up as well as the jib. Got along very nicely but the wind came further and further South and dropped below 15knots making the mainsail a bit flukey so we dropped her after a couple of hours. After 21 hours we arrived at Shelter Bay only to find there was no shelter! 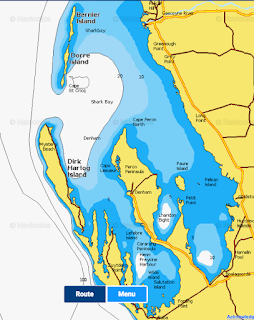 There are not very many deep anchorages in Shark Bay and there was a strong wind so we continued on another 40 miles to Denham. 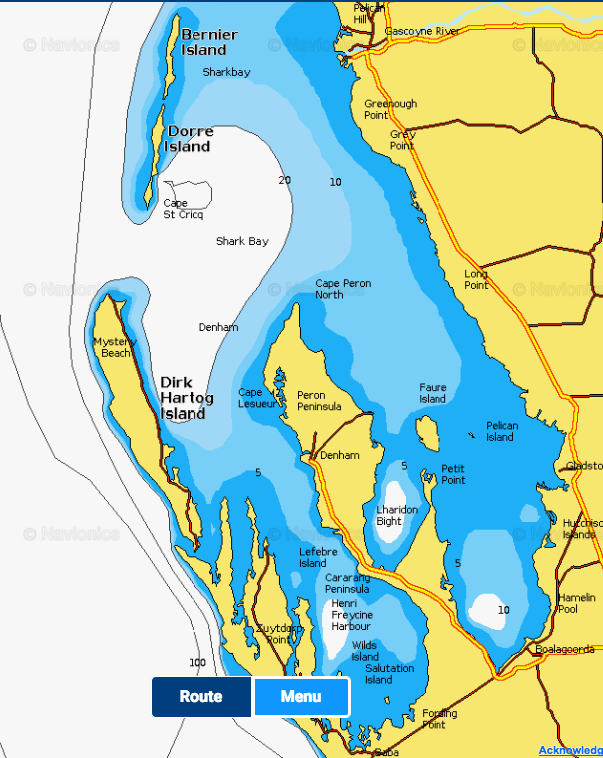 We were shattered and so happy to put the anchor down but also very pleased with our achievement of getting up the coast:) As you may be able to see from the chart below, Shark Bay is absolutely huge and took us 3 day sails to get across! 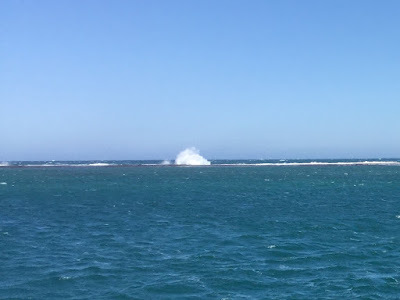 The wind came up very strong that night so we pulled up anchor and moved to the other side of Cape Peron, another 45 miles, to Guichenault Point. We got in late that night, in strong winds, and went to bed with the Anchor Alarm on. Next day was another big leg, 85 miles to Cape Cuvier. I never thought I would ever anchor here again. In 2014 we were beating into strong winds and only making 2-3 knots boat speed when Ron said, “I have had enough of this!” He pulled in to what we now know as Cape Cuvier. There is a salt mine there and we took a bit of a risk in the pitch black of night anchoring there but have now found it is a recognised anchorage for yachts sailing down the coast! There is not a lot of shelter but it has deep water under the high cliffs so good enough for a quick stopover. Just as we were approaching the Cape, Ron hooked 3 skipjack tuna at once on his lures! He managed to land 2 but lost one. I was very busy on the helm! I had to reduce boat speed, head out to sea, drop the sail and go forward or back at Ron’s direction!! We woke up to dolphins rubbing their bellies along the hull of the boat and feeding off the plankton:) So beautiful. It marked the beginning of one of the best legs up the coast. 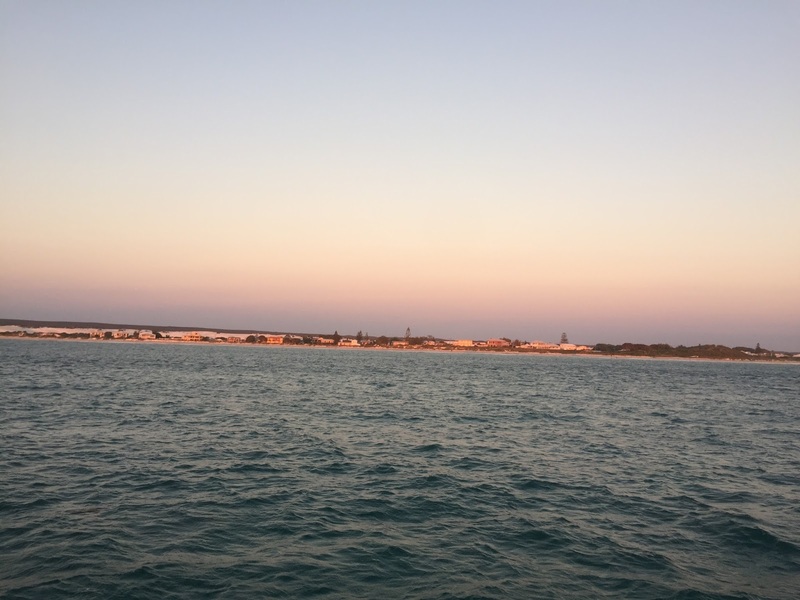 It was only a 4 hour trip to Gnaraloo Bay and the beginning of the Ningaloo Reef. It was warmer, calmer and such a beautiful sail. The anchorage was just in through a passage in the reef and in order to get away from the swell we went up into the head of the bay as far as we could given the depth. The water was a beautiful turquoise blue and there were campers on the beach. Naturally I was in the water for a swim as soon as we anchored! Water was 26 degrees! Much to my shock, not long after I had got out of the water a 10ft shark swam right beside the boarding ladder! Unfortunately the day did not end as well as it started:( Disaster struck! The snatching on the anchor when we were in bed was tremendous and we were afraid the rope snitch would pull the cleat right off the boat. We got up and realised we were in very shallow water. We decided we needed to move into deeper water. The anchor had wrapped itself around a coral bombie and we were stuck. Next we heard the most terrible crunching sound:( The anchor snatched so hard that it pulled the fairlead off the bow of the boat!! We couldn’t get the anchor up and we had to stop it from doing any damage to the beam running across the bow. Through sheer persistence and some good old Kiwi ingenuity, we managed to get free, pull the anchor up and decided we would motor through the rest of the night up to Coral Bay! Both our nerves were completely shot and we considered ourselves very lucky to have gotten away with so little damage! Luckily we have 2 fairleads! And 5 hours later we arrived at Coral Bay! We picked up one of the public moorings just outside the channel and waited until full tide. It was a hair raising experience 3 years ago with 3 of us watching for bombies off the bow and we were going in with just the 2 of us! It is very shallow in places and the channel twists and turns around the bombies for 4 miles! But Navionics has a new feature since 2014 called “Boat To”. We put a marker where we want to get to and put our draft and width into the settings and Navionics plots the safest course:) We also had the C-map chart zoomed right in to back up the depths and the course:) So with Ron on the helm and me on the depth sounder, calling the depths and the course - we made it through unscathed!! We got the anchor down just as Steph text to say they had arrived at the wharf! They had driven 1300kms through the night and all morning!